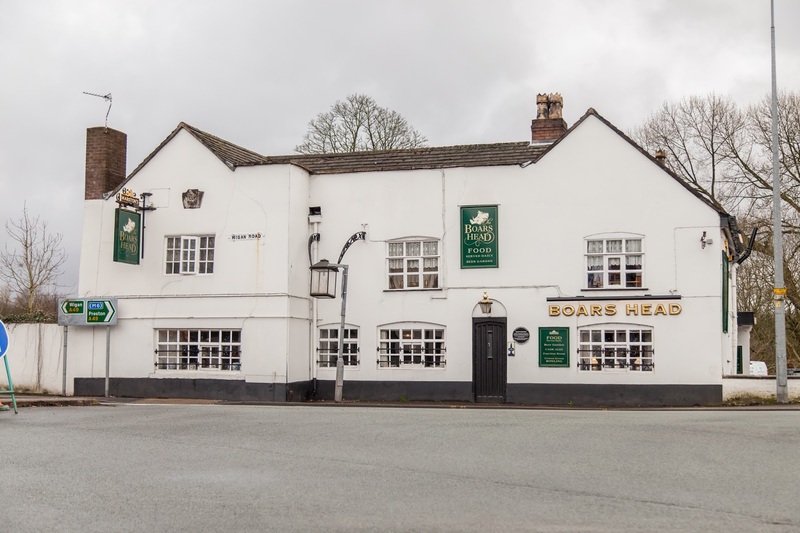 One of the oldest pubs in England – the Boars Head at Standish – has a rich history. 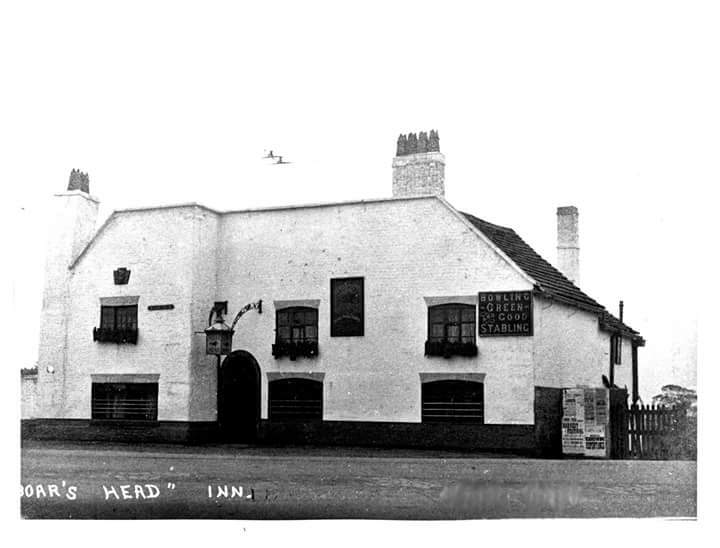 Russ Jervis and his partner Rene Heyes are already compiling a list of stories about the historic old pub, said to date back to the 13th century. 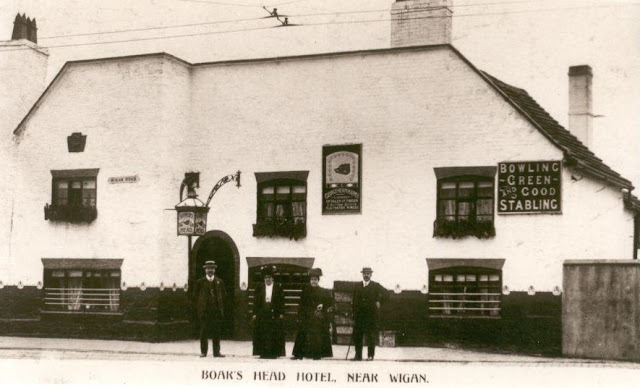 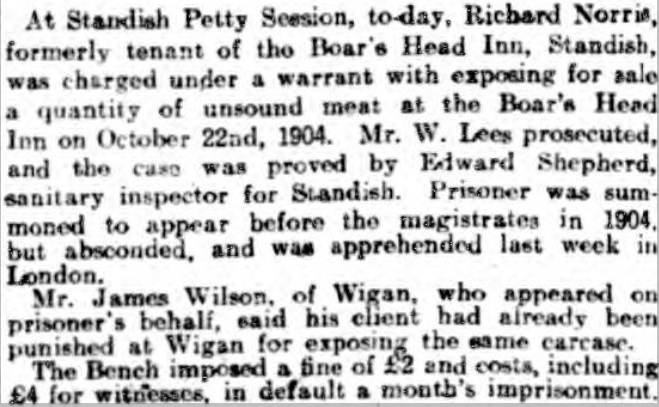 Russ, who also has Wigan’s Cherry Gardens Hotel, said the first news they received was that the Boar’s Head had not one but two ghosts. 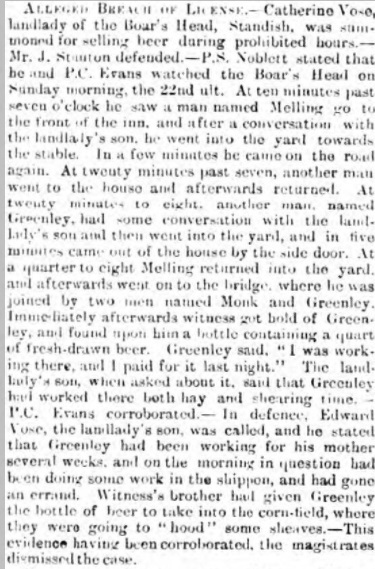 The first is said to haunt the cellar, the second the billiards room. As for the ghosts, it is said that the one in the cellar dates back to the days when prisoners transported from Chester Assizes to Lancaster for hanging were put up at the Boars Head along the way. 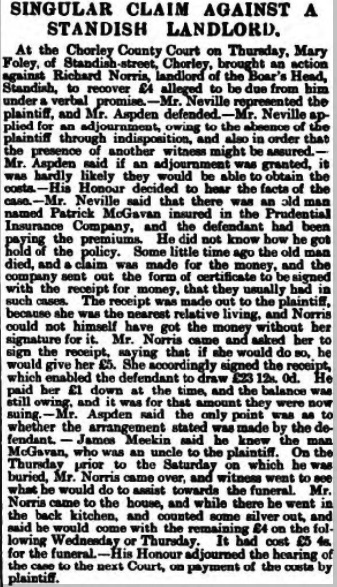 “It really is very spooky down there,” said Russ, who added that he had been told the spectre in the billiards room was something of a top-hat wearing toff. 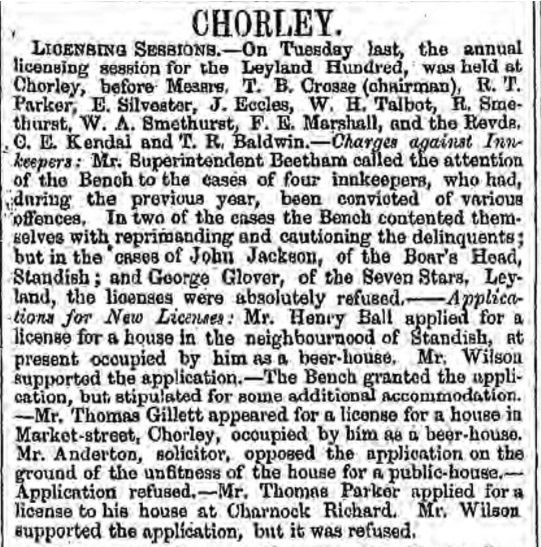 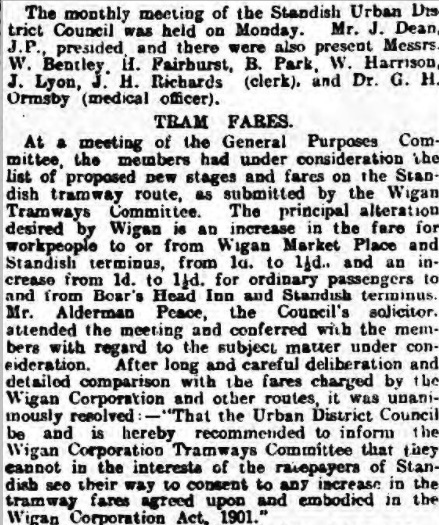 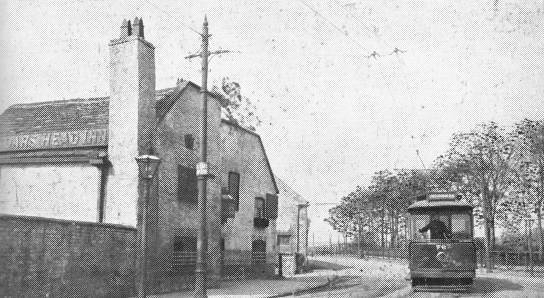 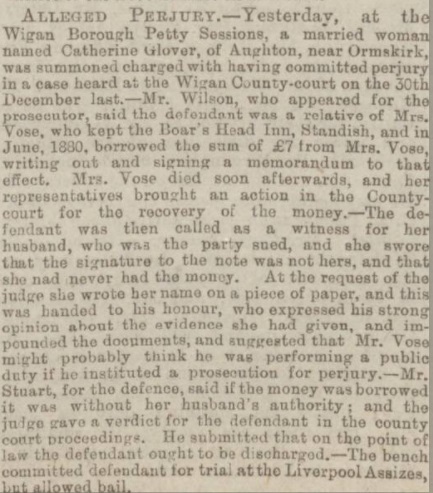 Located at the Boar's Head junction and close to the old railway station of the same name the Inn had a prominent position at the junction of the roads leading to Preston, Chorley and Wigan and would have benefitted greatly from the passing road and rail trade. 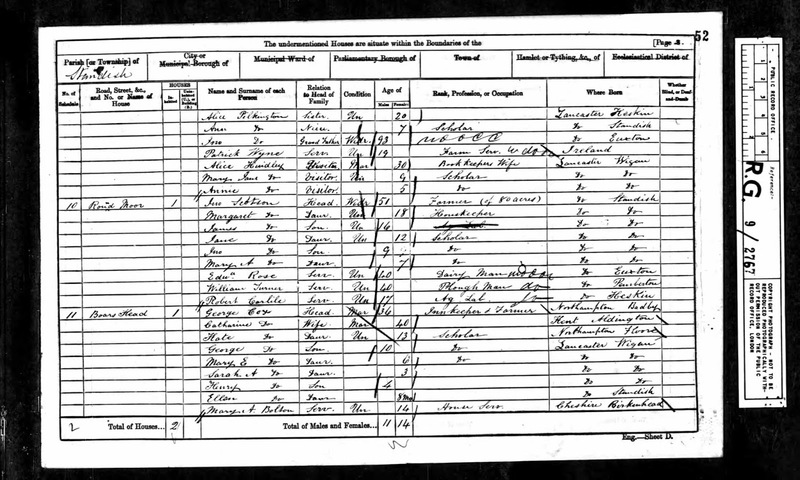 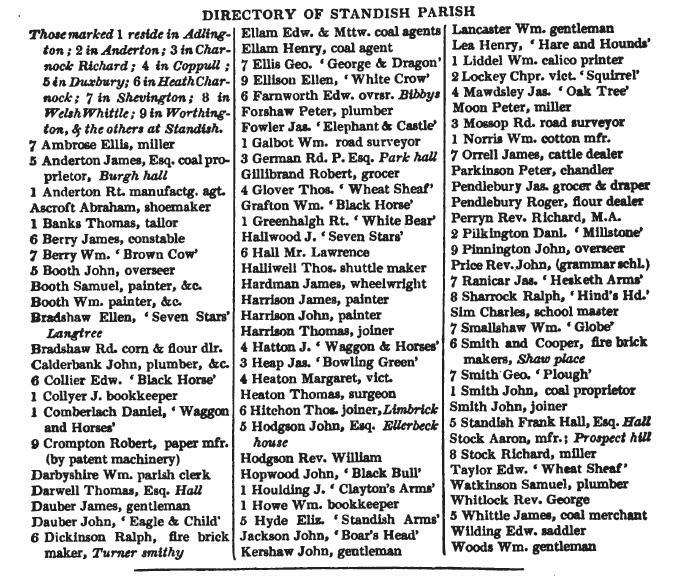 Listed landlords I can identify at the Inn from directory and census records were Lawrence Shorrock (1834), John Jackson (1824-58), George Cox (1861-62), John Pilkington (1862), Henry Liptrot (1869-74), Edward & Catherine Vose (1880-95), Richard Norris (1901-07), George Henry Harmer (1911), Joseph Gobin (1924) and Russell Jarvis (2008). 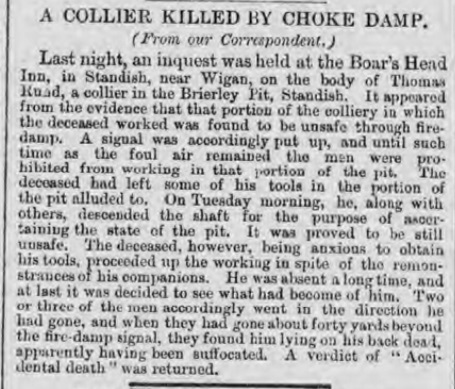 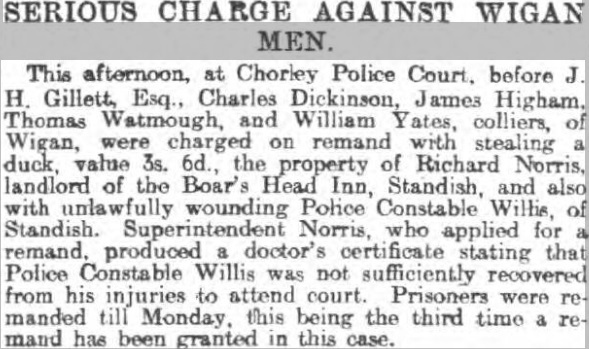 – A man named George Sharrock (40), contractor in coal mines under the Wigan Coal and Iron Co, met his death on Sunday morning last under shocking circumstances. 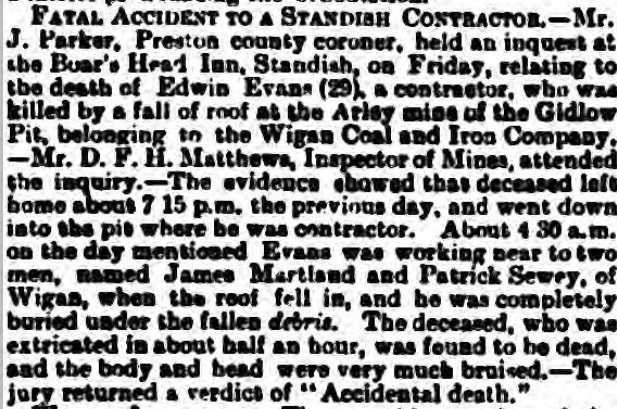 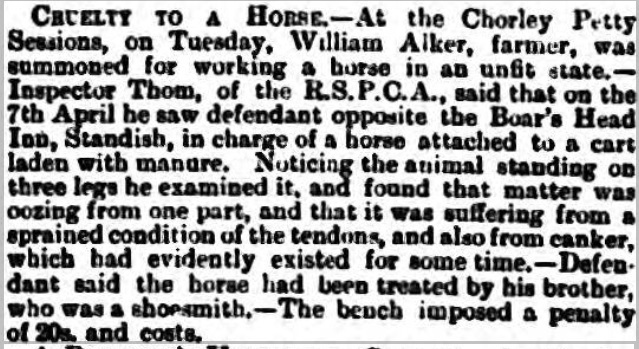 It seems that deceased along with his wife came to Wigan on Saturday night, and that they parted from each other about seven o’clock. 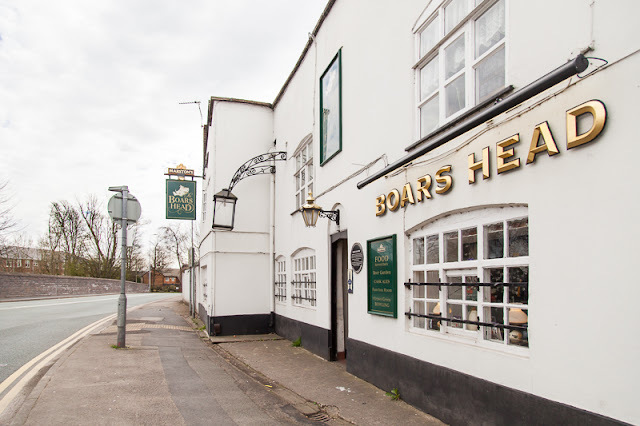 On his way home to Bed rock, Haigh, Sharrack called at the Boar’s Head Inn between ten and eleven o’clock. 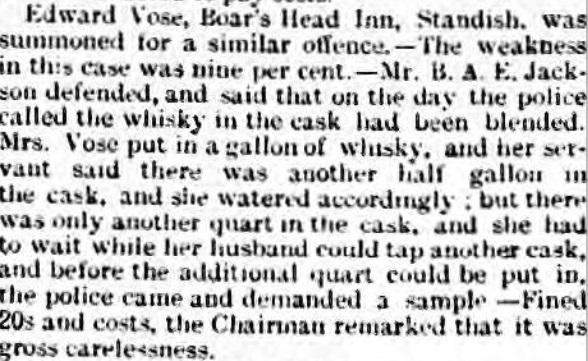 At eleven o’clock he was turned out drunk by the landlord, whose name is Liptrot (Henry). 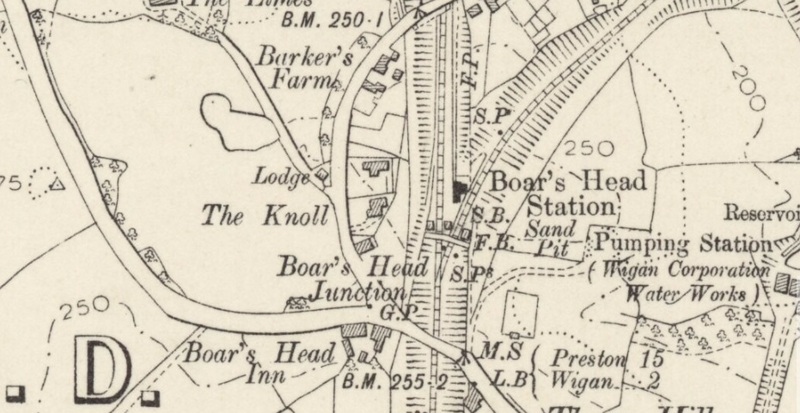 He had then wandered on the London and North Western Railway and laid himself down on the line. 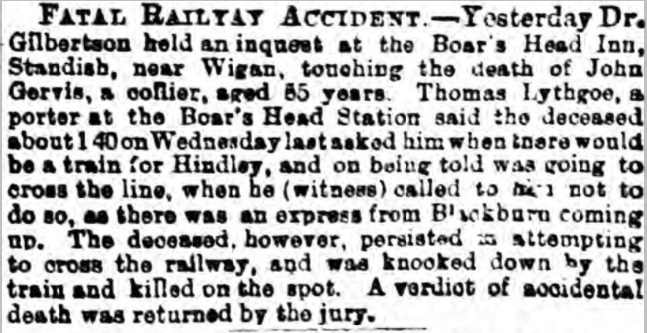 A goods train passing some times after his body was found completely severed in two. 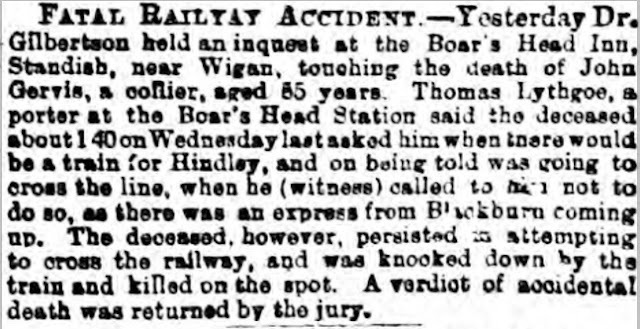 The guard in charge of the train felt a sudden jerk in passing over the body, and on the train being pulled up as soon after as it was possible, he, on going back, discovered the deceased. 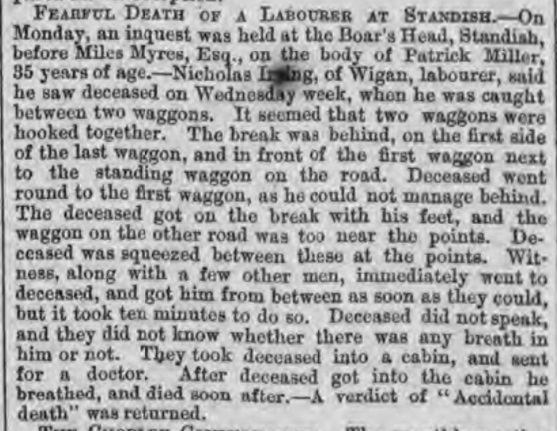 Three or four of the waggons were thrown off the line. 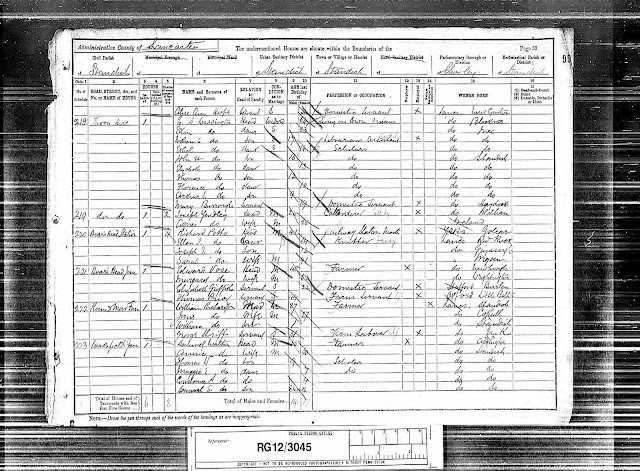 Deceased has left a widow and four children. 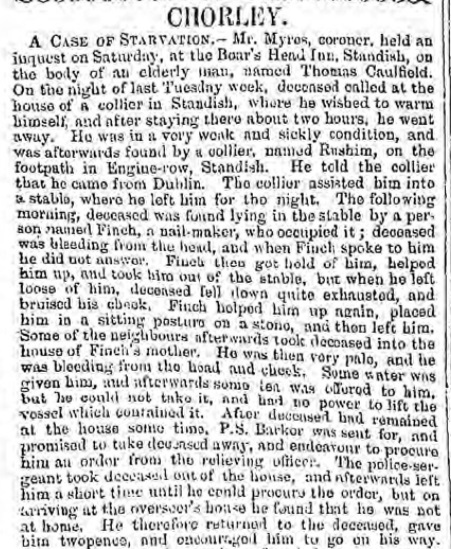 Very curiously Liptrot, who last saw Sharrock alive, has since committed suicide by hanging himself. 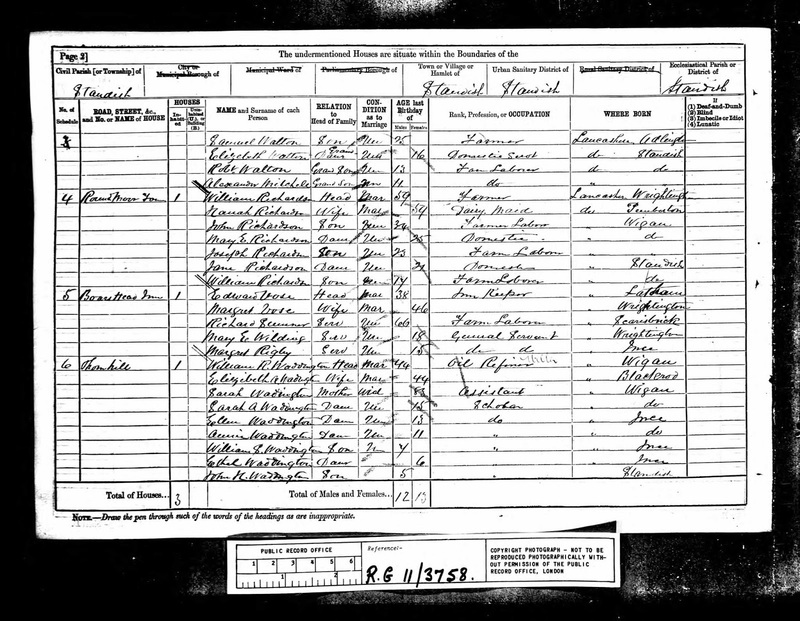 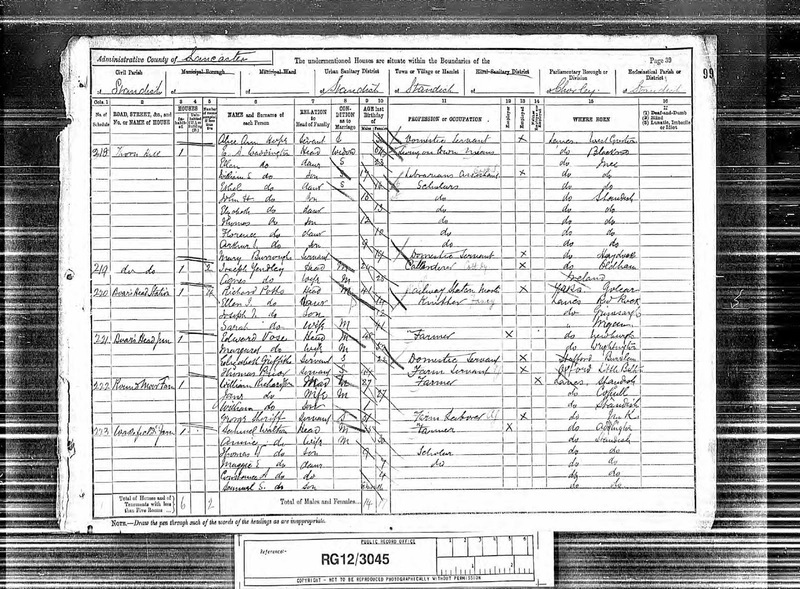 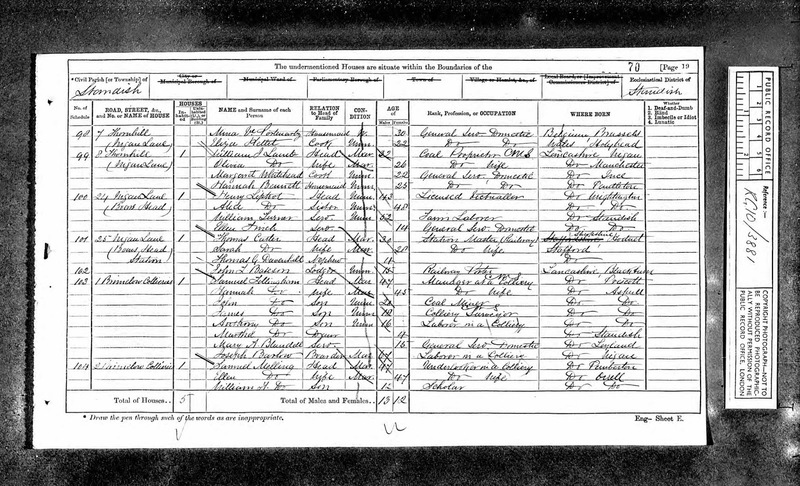 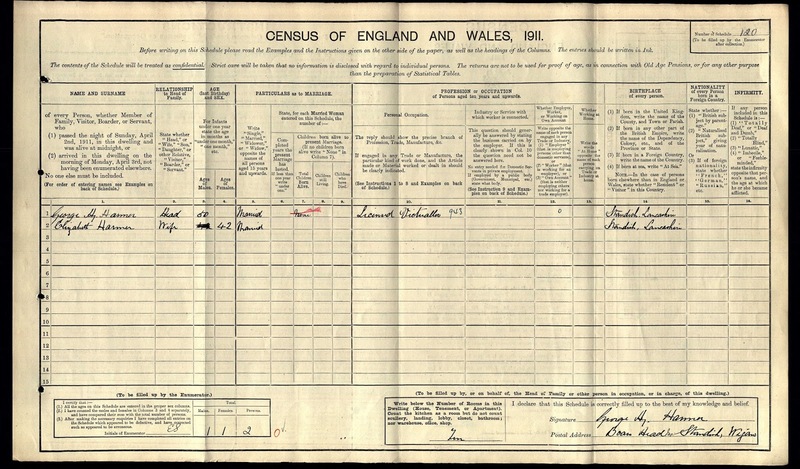 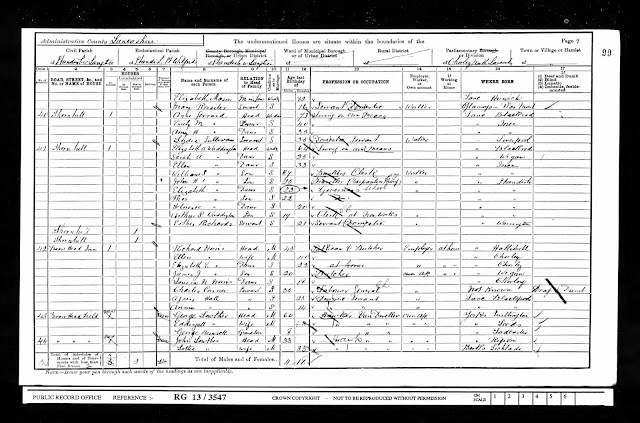 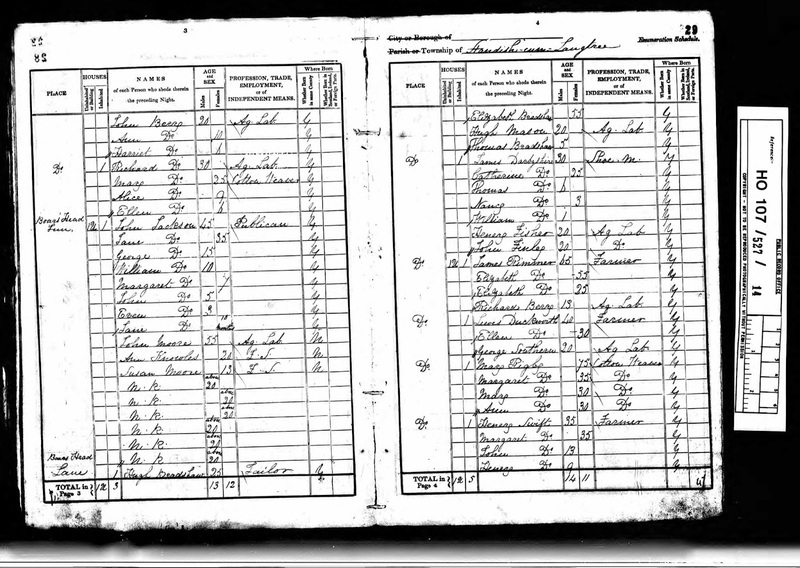 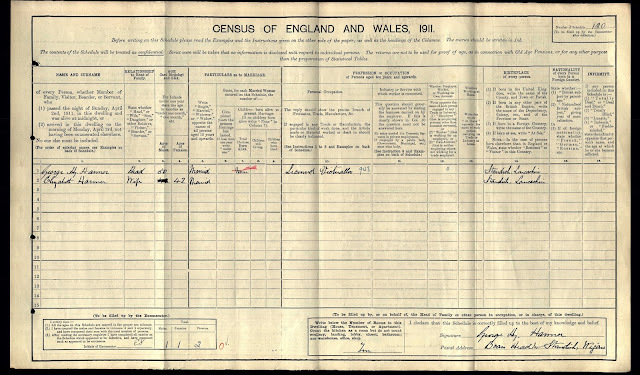 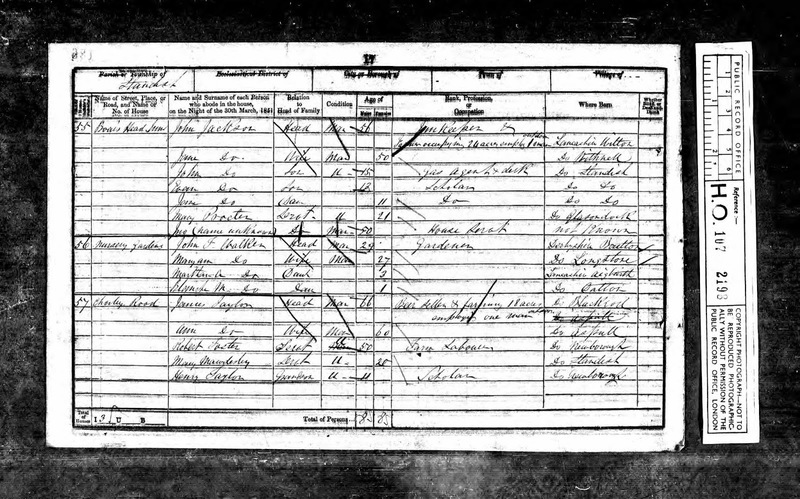 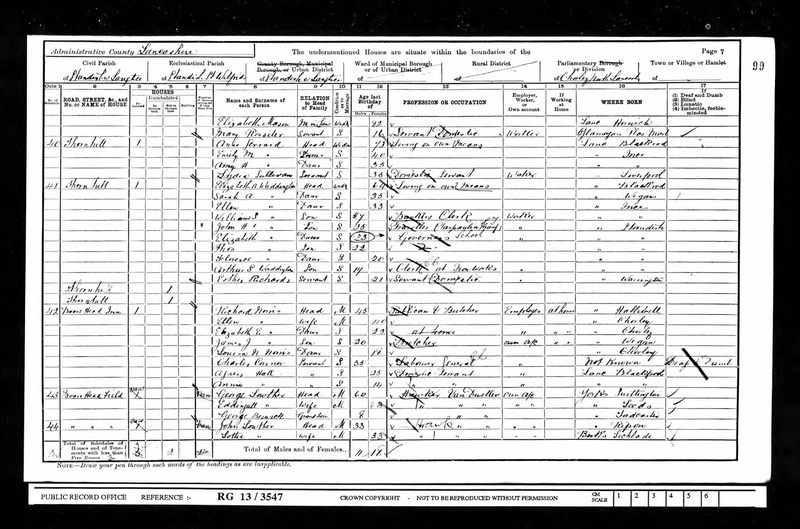 Like many Innkeepers during the 18th and 19th centuries Henry Liptrot also worked as a farmer as his Probate record from 1874 above showed.